74-76 Campbell Street Surrry Hills is a five-storey heritage listed building at the intersection of Elizabeth Street. The neighbourhood’s stories and buildings date back to the 1840’s, however it was during the 1920’s that it was home to generations of Chinese immigrant families working in the numerous sweat shops that served the precincts thriving rag trade. 74-76 Campbell Street became home to Chung Lun & Co clothing manufacturing and a needle factory servicing the surrounding tailors and seamstresses, and eventually the HQ for The Chinese Republic Newspaper. As an important media outlet for the area, it soon became an influential hub and source of local and foreign news for the community. Today, MUSE is a different kind of community. 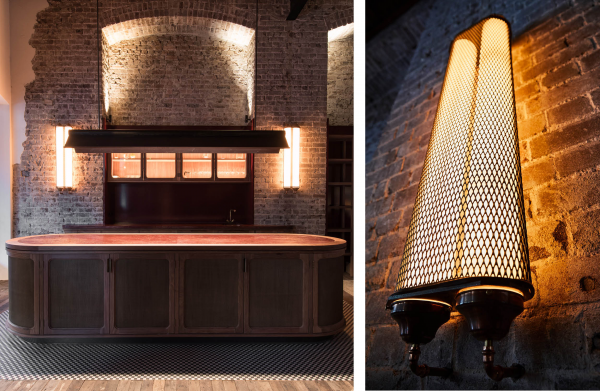 In 2017, the building was transformed into a private creative community set within the industrial heritage of yesteryear with the best of both original architecture and sophisticated, innovative interior design. 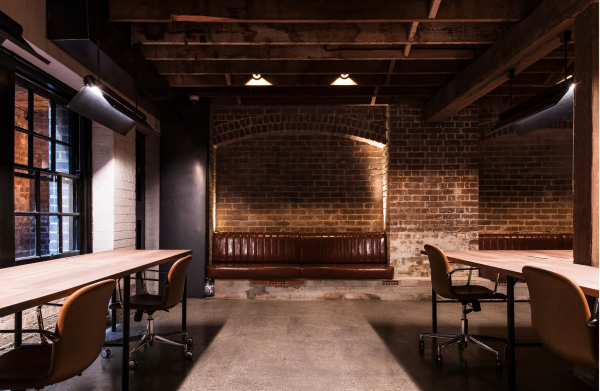 This Surry Hills work collective hosts leading creative entrepreneurs and businesses and is an inspiring home for creators in design, film, fashion, branding, architecture, art, journalists and copywriters. 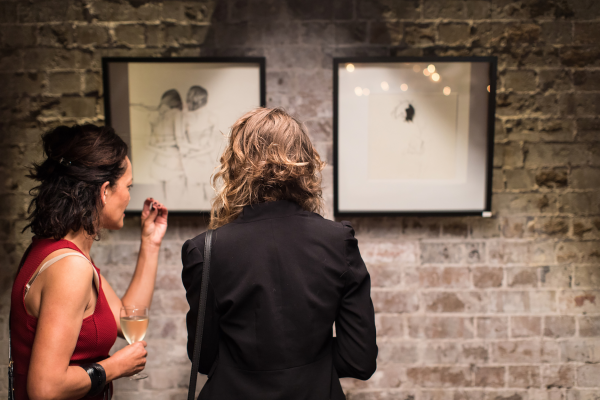 MUSE prides itself on offering a private and exclusive space for its members with a focus on innovation and relationship building. 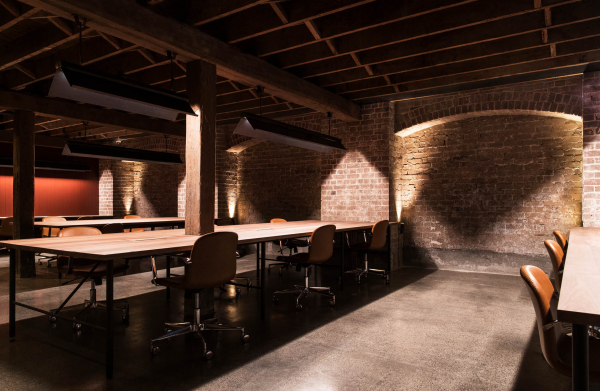 To create Sydney’s most unique and premium co-working experience, the building underwent a complete architectural and interior refurbishment. 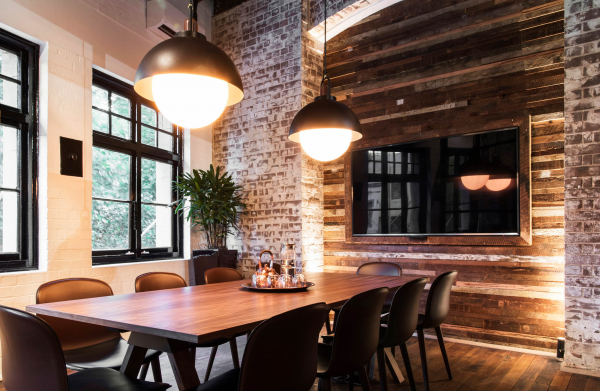 The brief to our team was to create an inspired, collaborative and creative workspace that could offer a level of experience, and a way of working that other co-working spaces are not providing. We wanted to stand out in a sector that has attracted considerable media attention, itself generating discussion and healthy debate about what constitutes the perfect work environment for the freelance and small business markets. 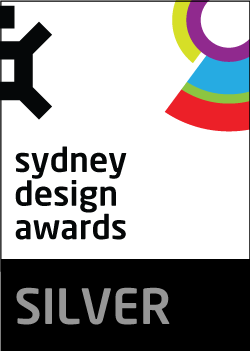 This was our cue to make a different mark in relation to aesthetics, amenities, benefits and perceptions. In keeping with his vision for the space, MUSE Director, Nick Sammut looked to the talents of iconic and award-winning architect Vince Alafaci and acclaimed interior designer Caroline Choker of ACME & Co (The Grounds of Alexandria) to design and build a truly crafted space. 74-76 Campbell Street is an expansive property. Due to the building’s age, history and heritage of the building, the level of care and detail executed across the build, construction and interior design was significant. Ensuring appropriate consistency throughout while creating different spaces for different purposes was important not only for navigation throughout but to create a vibe that would appeal to both members and newcomers. MUSE offers a genuine combination of lifestyle benefits fused with the co-working space philosophy. This is a work environment that caters to the seasoned professional who is ready to pay for premium benefits alongside like-minded people. What sets MUSE apart from its competitors is the concept that inspired individuals are together an inspired whole leading to a superior level and heightened sense of creativity and productivity. 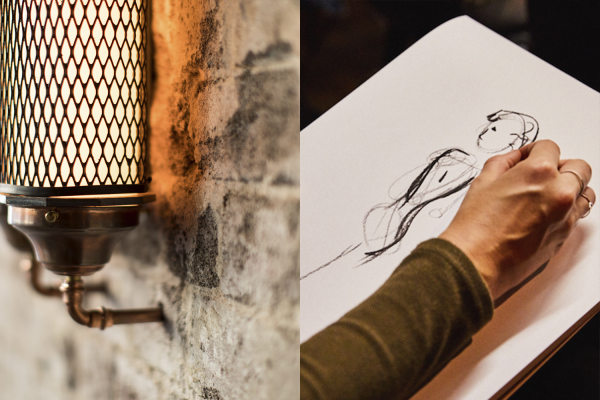 MUSE pays homage to exposed brick, high raked ceilings, solid timber floors, and sleek, premium work spaces. Consider an exclusive, vibrant, open-plan, sophisticated workspace that also offers charm and technology. It’s an all-in-one workplace solution catering to the modern, discerning creative professional. understated and luxurious aesthetic that sweeps effortlessly across spaces from meeting rooms and break out areas on each level, to the private courtyard, rooftop garden, the internal library of architecture and design, and across all amenities. 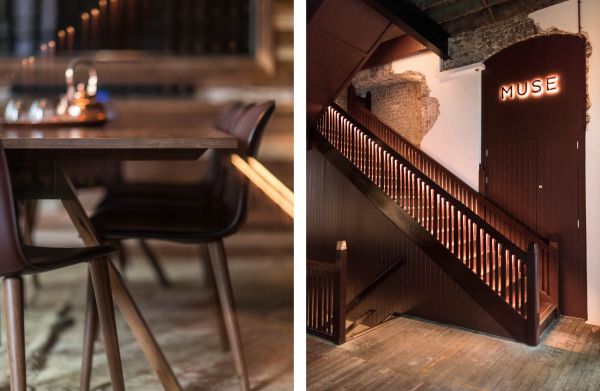 The inherent character of the building with its solid timber flooring, exposed beams and brickwork leant itself to an interior design that is restrained yet confident. Recognising that the existing space was already filled with a rich history of its own was a clever base canvas from which to work. A distinctive yet uncomplicated palette of colour, texture, materiality, furnishings and warm lighting were selected for the project. The concept is expressed throughout the building with each space clearly articulating its function yet displaying its own character, a challenge of itself. 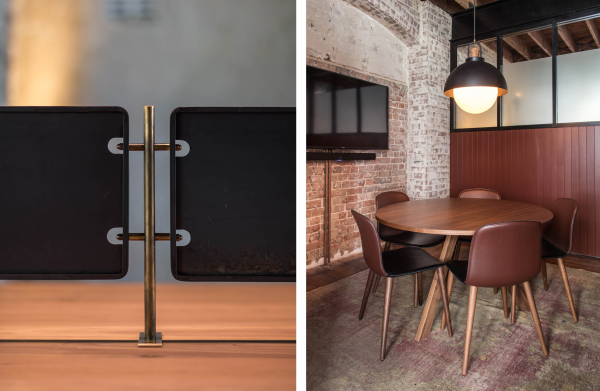 An espresso bar on the entry level and the availability of catering options makes MUSE’s collaborative co-working offer a hard-to-beat option for those looking to elevate their business to the next level. The continuous feed of functionality and experience is evident in the finer details too such as with the digitised meeting room booking system, boutique toiletries, shower facilities and Egyptian cotton-linen towels and hand towels, fully equipped kitchenette, all day coffee and fruit and a dedicated concierge who looks after all members from dusk till dawn. 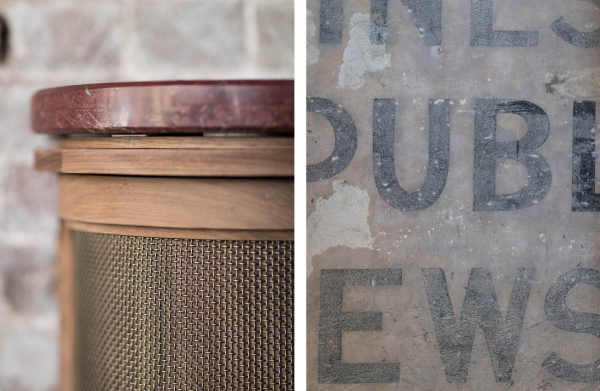 We reused many of the raw and old elements in the interior design features. Timber decking and metal cladding from the rooftop was reused for wall features internally including meeting rooms. This is a sublime space that has been repurposed to create an optimal work ethic and advance creativity. On entering the ground floor or street level, you at once feel immersed in the site’s history. Evidence of its past is purposefully exposed, celebrated and embraced for a different and new future. The exposed brickwork throughout is a strong remnant of the building’s past much like the solid timber flooring and exposed beams. These retained and consistent features serve to anchor the MUSE journey guiding the visitor confidently from one level to the next.